You can learn how to make Sangria for your friends and family. Sangria is a delicious wine punch often served in restaurants. With some basic ingredients, rum and a sweet red wine, you can make a pitcher of sangria in time for tonight's get-together with friends. Sangria is not a difficult punch to make and the ingredients are readily available no matter where you live. The time it takes to make this punch is well worth the effort, and your friends will love the results. Each recipe is unique depending upon which fruits are in season and which types of wine and rum the Sangria chef prefers. Chill the fruit, wine and orange juice. Slice the fruit thinly and place in the bottom of a pitcher. Pour in the rum and sugar. Chill for at least two hours in order for the flavors to meld. When ready to serve, crush the fruits with a spoon and then pour in the orange juice and wine, mixing well. Take the first four ingredients and mix well; refrigerate for eight hours. Place the fruit in a bowl and cover with the two cups of rum and two cups of orange juice then refrigerate for eight hours. Drain the fruit and reserve the liquid for another batch of sangria if desired. Mix all of the remaining ingredients together and serve. If the mixture is too potent, add lemon-lime soda or ginger ale to water it down. Mix the soda and instant tea mix in a punch bowl until well blended. Adjust sweetness if you have used unsweetened instant tea mix. Add crushed ice and float the citrus slices on top of the bowl. Serve immediately. Mix all of the ingredients except the lemon-lime soda together in a punch bowl. Refrigerate for at least six hours or overnight. When ready to serve, add the lemon-lime soda and enjoy! 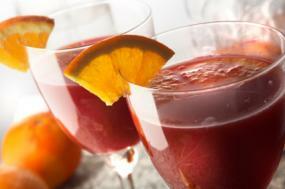 Once you learn how to make sangria, you can experiment with various fruits, rums and red wines. Remember to cut or slice fruits in small pieces so the combinations you use will yield the most flavor. Sangria creators should note that using a lot of apples and pears in their recipes could significantly dilute them because these fruits tend to absorb a lot of rum. If you plan on using either one of these fruits, limit the amount you put in each recipe. Finally, remember that any batch of sangria can be diluted with a lemon-lime soda or ginger ale if you find it is too potent. You want your guests to enjoy this punch, not make them intoxicated!